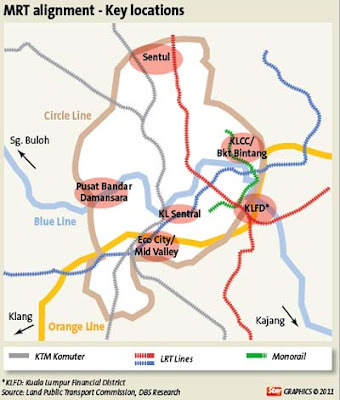 KUALA LUMPUR: The second mass rapid transit (MRT) line, which circles the Kuala Lumpur city centre (KLCC) orbital and known as the “circle line”, is already in the final planning stage. The details are expected to be announced in March. “Its alignment must depict the current and future business districts in Kuala Lumpur,” said Minister in the Prime Minister's Department and chief executive officer of Pemandu Datuk Seri Idris Jala during an Economic Transformation Programme (ETP) update to analysts and fund managers recently. In the longer term, a third line to Port Klang was being comtemplated, he said. The circle line is expected to cover the hotspots surrounding the KLCC, Jalan Bukit Bintang, the new Kuala Lumpur International Financial District in Dataran Perdana, KL Ecocity, Pusat Bandar Damansara and Sentul, among others. Meanwhile, the “blue line” the first line which is a 50km alignment that covers Sungai Buloh to Kajang, via Pusat Bandar Damansara and Bukit Bintang is slated for completion in 2016. The network of all the three MRT lines will be fully operational by 2020. “Greater KL now has a population of 6 million people. By 2020, we will have 10 million people. If we don't have the MRT, the city will be choked. Right now, nearly everybody drives. This is not sustainable,” said Idris. He added that currently 13% of people commuted using urban transportation. Under the ETP, Idris said this should increase to 50%, adding that the funding structure for the MRT would be disclosed by end-February. “Apart from reducing travelling time, the MRT will also cause property prices to appreciate because of better accessibility. If your house is near the MRT station, prices will go up because of the commercialisation created around the area,” said Idris. Some analysts are wary of the ambitious plans laid out by Pemandu. “As usual, it's a case of execution. Will the Government be able to actually implement the project? We'll need to see it being done to believe it. More importantly, how is the Government going to fund this project?” asked a construction analyst. Another analyst said the Government was likely to reduce cost by getting developers to co-fund some of the MRT stations. On implementation, he said that Pemandu would have learnt from past lessons of the LRT, monorail and commuter train. Some brokers have notably been able to analyse the impact of the proposed MRT comprehensively. In a Malaysia Market Strategy Report titled “Property boom-boom” released on Jan 26, global investment bank UBS' head of research Chris Oh said Malaysia was set to enjoy improved connectivity in the coming years with the proposed infrastructure rollout of the MRT system and possible high-speed rail linkage between Kuala Lumpur and Singapore. He said the MRT captured the imagination of the people, developers and investors. He expects property value around a radius of 20km of the city centre to rise significantly. 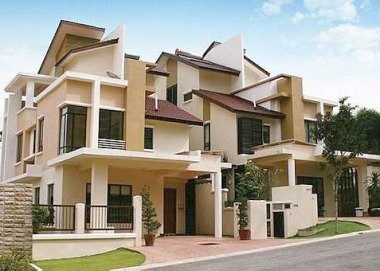 The preference would be on developers who have vast landbank with high-density mixed development around MRT stations. “Interest in Malaysian property will be fuelled by foreigners looking out for higher returns (via undervalued currency and low entry costs) than their home countries (Singapore and Hong Kong) and the absence of significant restrictions on property ownership by foreigners,” said Oh. Singapore-based DBS Research was the first to issue a property sector report titled “Entering a Golden Era” on Jan 14, analysing the impact of MRT on the property sector. In the report, the firm was projecting boldly that land values in MRT hot spots could jump by up to six-fold over the next five years. She said the MRT would have a strong structural impact on the Kuala Lumpur real estate, given that the KL city had been under-invested since the last wave of mega-projects in the late 1990s. The new MRT will create new opportunities for high-density mixed developments, urban renewal and new suburban townships. In turn, this has boosted the potential for land prices to reach new peaks with higher plot ratios and more commercial developments. Other than existing prime areas, she identified KL Ecocity, Pusat Bandar Damansara and Sentul as new locations for high-density developments to watch out for. The real estate investment trusts market is expected to be an attractive investment with positive macro economy numbers and higher disposable income. More property groups are likely to set up real estate investment trusts (REITs) in Malaysia this year as the market continues to stay attractive, said the manager of a major property trust. "With positive macro economy numbers and higher disposable income, we expect the REIT market to be an attractive investment," said Datuk Jeffrey Ng, the chief executive officer of Sunway REIT Management Sdn Bhd (5176), the manager for Sunway REIT. Sunway REIT is Malaysia's largest REIT, and it is also the largest REIT initial public offering in Asia, excluding Japan, since 2007. It was launched by Sunway City Bhd and Sunway REIT Management last July, with eight assets worth RM3.7 billion. Sunway REIT is expected to double its asset size to RM7 billion in five years, which will comprise 60 per cent of retail properties. Ng said it is looking for properties to buy, but he declined to elaborate. 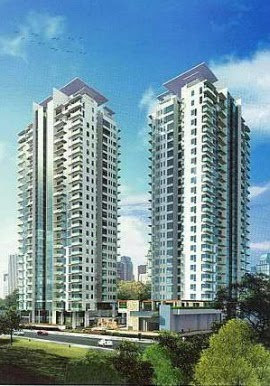 Pipeline properties include the two new phases to Sunway Pyramid mall, now known as SP3 and SP4. Ng said Sunway REIT has helped to bolster the equity market and made it more attractive to foreign institutional players. "Before the entry of Sunway REIT, the Malaysian REIT (M-REIT) market was never on the international radar screen as the players were too small to attract foreign investors. "With Sunway REIT coming in, I think we have been catalytic to put M-REIT back on the global funds' radar," he said on Friday in Bandar Sunway, Selangor. Sunway REIT's assets are Sunway Pyramid Shopping Mall, Sunway Carnival Shopping Mall, SunCity Ipoh Hypermarket, Sunway Resort Hotel and Spa, Pyramid Tower Hotel, Sunway Hotel Seberang Jaya and two office towers. Sunway REIT is 58 per cent held by institutional funds like the Employees Provident Fund, Permodalan Nasional Bhd, Government of Singapore Investment Corp and Great Eastern Life Assurance (M) Bhd. Some 26 per cent of the trust is held by foreign unit holders. ECM Libra Investment Research expects the loans growth to taper off in anticipation that property sales growth may slow down in late 2011. Residential and non-residential property loans which accounted for 44 per cent of loans growth in 2010 are already showing signs of growth moderation, it said in a research note today. Residential loan approval has contracted 3.8 per cent year-on-year in December while non-residential loan approval slowed to 30.2 per cent from 47.3 per cent in November. "Loans growth will also be dampened by an impending statutory reserve requirement (SRR) hike and imposition of macroprudential lending measures as guided by Bank Negara Malaysia in its latest monetary policy statement on Jan 27," said ECM Libra. In the near term, it said, loans growth is expected to remain intact as lending indicators continue to be in positive territory with loans application and approvals in December 2010, increasing by 36.5 per cent and 17.4 per cent year-on-year, respectively. "That said, loans disbursement contracted by 2.8 per cent year-on-year in December," it added. Loans grew by 12.8 per cent to RM883.6 billion in 2010. Both household and business loans growth moderated in December at 13.4 per cent and 12.1 per cent, respectively. The loan-deposit ratio remains high at 81.4 per cent from Nov 10 at 81.3 per cent, which is close to the seven year high of 81.7 per cent reached in Oct 10. "This was due to deposits growing at 7.3 per cent as compared to the loans growth of 12.8 per cent. We believe the lagging deposit growth may curb loans growth momentum going forward," ECM Libra said. ECM Libra said it has maintained the neutral call on the banking sector as loans growth is tapering while net interest margins is under pressure going forward. Meanwhile, OSK Research Sdn Bhd has maintained its view of loans growth for 2011 as remaining robust, with the rise in interest rates from record lows unlikely to dampen pent-up credit demand spurred by a recovering economy. "The banking system's capitalisation remains sufficient, with the risk weighted capital and core capital ratio, standing at 14.6 per cent and 12.8 per cent, respectively," it added. SP Setia Bhd remains in the 'sell' zone despite the positive acquisition of a 106.2 hectare (262.5 acres) land in Tebrau, Johor, last Friday, ECM Libra Investment Research said today. It target price was at RM6.00 per share. "We are not imputing any earnings from this new project into our model yet, until there is more clarity on the development timeline," the research house said in a note. generate a gross development value (GDV) of at least RM700 million, ECM Libra added. It also expects the project to be launched in FY12 with the contribution commencing from FY13 onward. With the new acquisition, SP Setia will have six projects in Johor. KUALA LUMPUR: AHMAD ZAKI RESOURCES BHD and Jasa Bakti Sdn Bhd have been awarded a RM125 million contract to undertake a public housing project in Kuala Terengganu. AZRB said on Monday, Jan 31, it had received a letter of acceptance from the Housing and Local Government Ministry to build 1,002 flats under the public housing program (PPR-for rental) in Changang Tiga, Kuala Terengganu. “The award for the works amounted to RM125 million. The works are to be completed within the period of 30 months; that is commencing from Feb 16, 2011 to Aug 15, 2013,” it said. 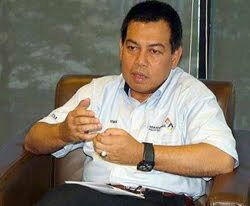 JOHOR BARU: Iskandar Regional Development Authority (Irda) chief executive officer Ismail Ibrahim says attracting new investments to Iskandar Malaysia is going to get tougher and more challenging. He said although the country's first economic growth corridor was making significant progress and moving in the right direction, albeit uncertainties in the global economy, Iskandar could not afford to rest on its laurel. “The intensity of the competition is becoming greater and we have to prove our sceptics wrong that Iskandar is indeed taking shape as planned,'' Ismail said in an interview with StarBiz. He said the challenge was not only in attracting new investments to Iskandar, but also receiving financial support from the Government for infrastructure development projects. Under the Comprehensive Development Plan 20062025, Iskandar is set to transform into a metropolis of international standing. Iskandar, launched on Nov 4, 2006, is located in the southern most part of Johor and spans over 2,217 sq km. It is three times bigger than Singapore and has five flagship development zones JB City Centre, Nusajaya, Eastern Gate Development, Western Gate Development and Senai-Skudai. The corridor has attracted investments totalling RM67.68bil up to November last year. A total of RM39.42bil, or 58%, of the total investment was from domestic investors and the balance from foreign investors. Of the overall investment received, RM6.28bil was from the public sector; RM14.45bil went to tourism, utilities and others; RM20.25bil for properties; and RM26.38bil for the manufacturing sector. During the same period, RM27.61bil or 40.8% of the total committed investments have been spent on development projects in the region. Ismail said Irda would continue to work closely with government agencies like Malaysian Industrial Development Authority and Malaysia External Trade Development as well as foreign missions to promote Iskandar. He said Irda also had a good working relationship with the Johor State Investment Centre (JSIC) although Irda's coverage was limited to Iskandar only, while JSIC covered the entire state. Irda is the regulatory body mandated to plan, promote and facilitate the development of Iskandar. Prime Minister Datuk Seri Najib Razak and Johor Mentri Besar Datuk Abdul Ghani Othman are the co-chairmen. “We are mindful of the growing Asia-Pacific region and we are coming out with programes to attract more investments from China, India, Indonesia and Singapore,'' Ismail said. He said besides these countries, Irda would continue to woo investors from Europe, the United States and the Middle East, and would likely to extend its reach to Brazil, Russia and South Africa. Ismail said although the economies of Europe and the United States were still in the doldrums, Irda believed that they still offered good investment opportunities for Iskandar as not everyone there was affected by the downturn. He said Iskandar was now in the second phase of its road map which focused mainly on attracting new investments and the completion of phase-one projects. Ismail said Irda would have more outreach programmes this year with the private sector, which would not be limited to meeting them as groups in seminars or conferences, but would be on one-to-one basis. “We want to engage them better and intensively so as to share our plans for the private sector in Iskandar and vice versa,'' he said. Ismail said the private sector stakeholders included property developers, investors, chambers of commerce, small and medium-scale enterprises and land owners. On why the Government decided to allocate an additional RM600mil for Iskandar in November from the RM339mil announced by Najib in Budget 2011, he said the Government must have its own reasons for that. Ismail said the bulk of the allocation would be spent this year on ongoing projects like the New Coastal Highway, Iskandar Malaysia public housing project and river cleaning works. “We believe (the extra allocation) has got to do with our timely delivery of our infrastructure projects and the commitment shown by us and the new projects already in the pipeline,'' he said.